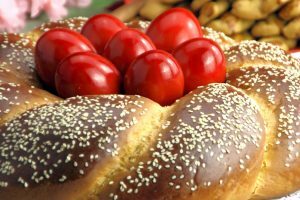 While the islands and villages of Greece are known for their religious festivals during the period of resurrection, spending Greek Orthodox Easter in Athens is as memorable as it is spiritual. 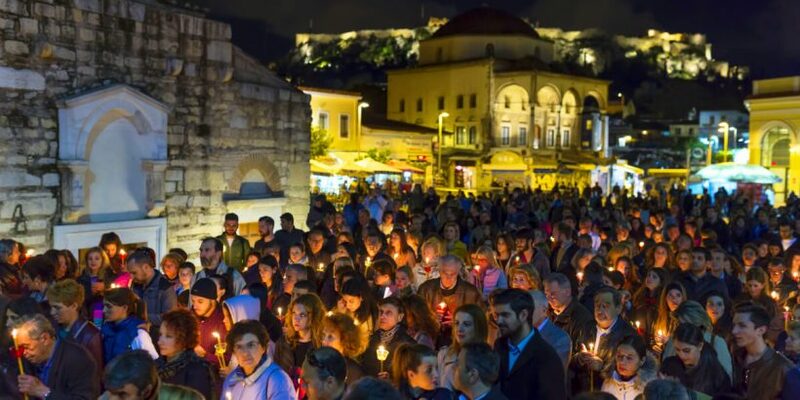 Athens is home to some of the most beautiful and historical churches in Greece and the city has its finest moments under candlelight for the traditional services during holy week. On Easter Saturday, in a ritual conducted for over 1,200 years, the ‘Holy Fire’ is lit at the Church of the Holy Sepulchre in Jerusalem, where Jesus was crucified, buried and resurrected. 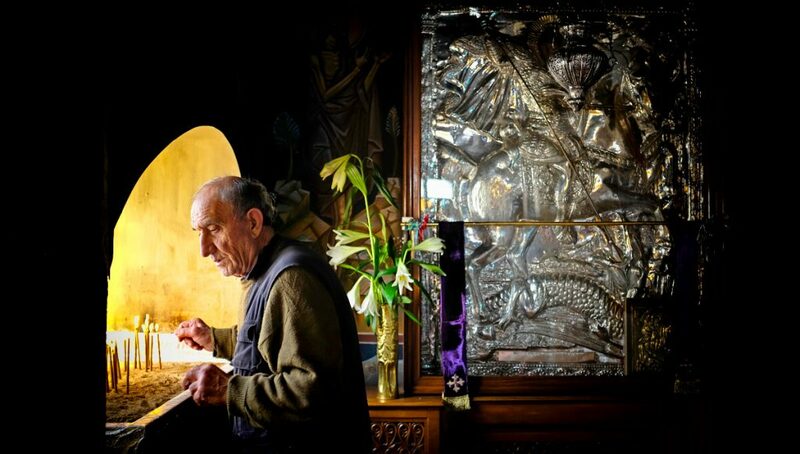 The light is then flown into Athens on a specially chartered flight and received by the Metohi tou Panagiou Tafou church in Plaka where candles are lit and then dispersed to churches throughout the Attica region in time for the start of resurrection services. Athenians gather on the Tuesday evening before Easter to hear the melodic Hymn of Kassiani, also known as the Hymn of the Fallen Woman. The hymn is only heard once a year and the church of Agios Nikolaos or St Nicholas in Plaka, is popular with locals. 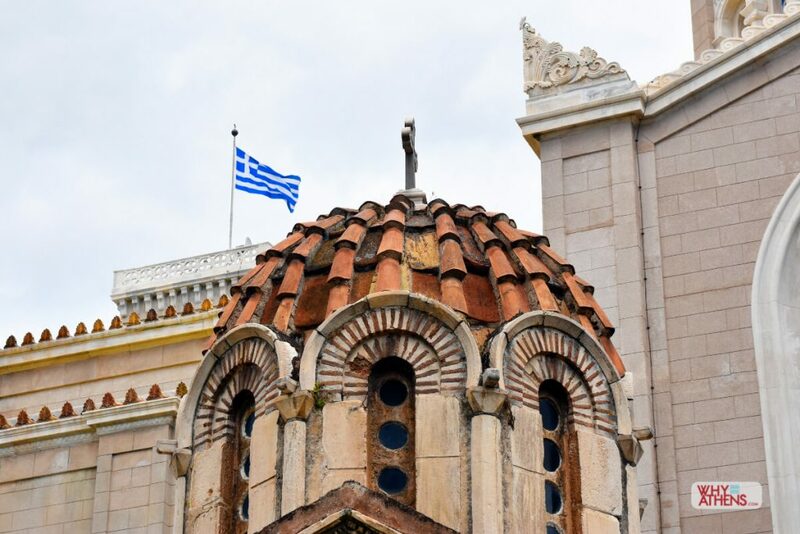 The Church is famous for its church bell, which was the first to ring in Greece to signify the end of the Greek War of Independence in 1833 and again on October 12, 1944 after the liberation of Greece from the Nazis. If you are orthodox or interested in the communion process, Holy Wednesday is one of the only opportunities to take communion during a morning service. We recommend the Church of Panagia Kapnikarea, built around 1050AD. 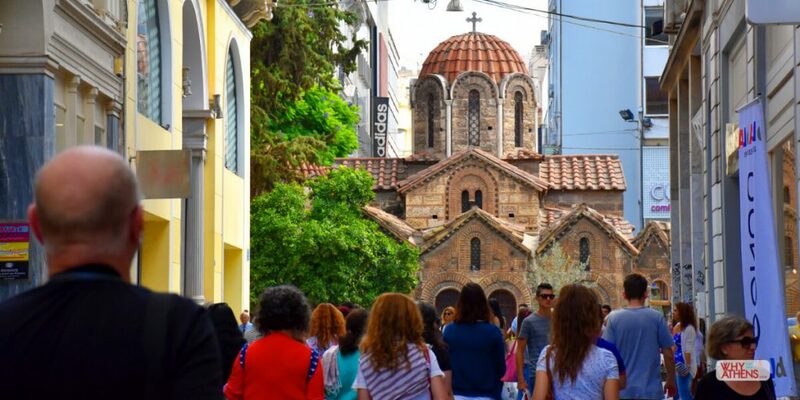 It is one of the oldest churches in Athens and known for its location in the middle of Ermou Street, one of the first mercantile streets built in Athens which remains a central shopping district of the city. On Wednesday night, another important service known as the Holy Unction takes place where parishioners approach the priest for a prayer to be spoken in their name. Holy oil is placed on each parishioners forehead for both spiritual and physical healing. 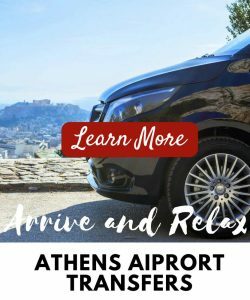 This service is a perfect opportunity to visit the recently unveiled Metropolitan Cathedral of Athens on Mitropoleous Street, or to see the incredible iconography of St Dionysios Church in Kolonaki. The sanctity of Good Friday also makes it the most unique to witness and participate in. 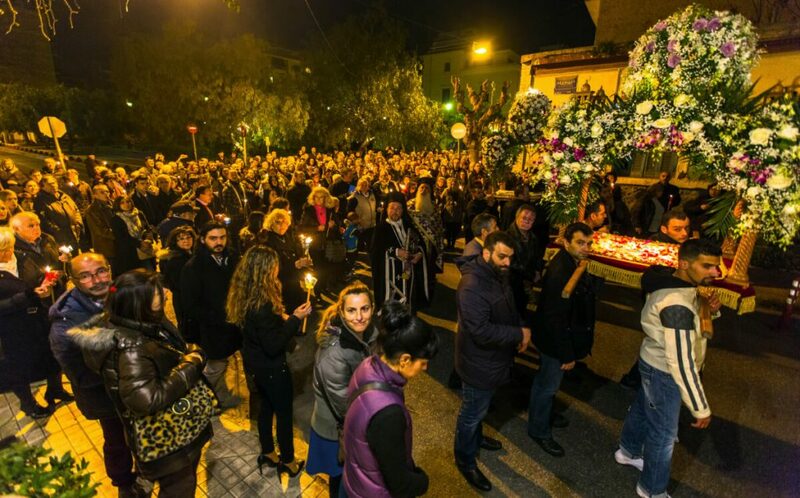 On Friday afternoon, services around Athens are conducted and the ritual of dressing the epitaph (tomb of Christ) with flowers takes place and is a real highlight during Greek Easter. The evening service is the most solemn on the religious calendar and at around 9pm the epitaph is brought out of the church to lead a candlelit procession through the streets, circling the church before returning to be rested. The Church of Agios Georgios (St George) in Karytsi Square, holds a procession through the streets of Athens led by members of the Greek Navy. 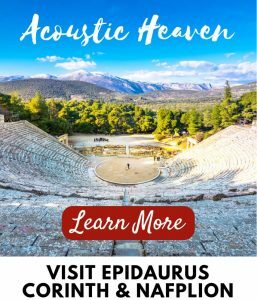 The Church is also famous for its mesmerizing hymns sung by the Themistoklis Polykratis’ vocal quarter, which has been singing the Easter hymns for over 120 years. 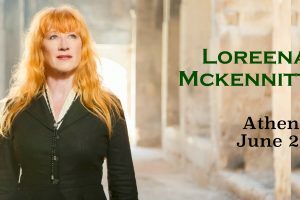 Another church to experience musical excellence on Good Friday in Athens is Agia Irini (St Irene) Church located in the central Athens square that is named after her. 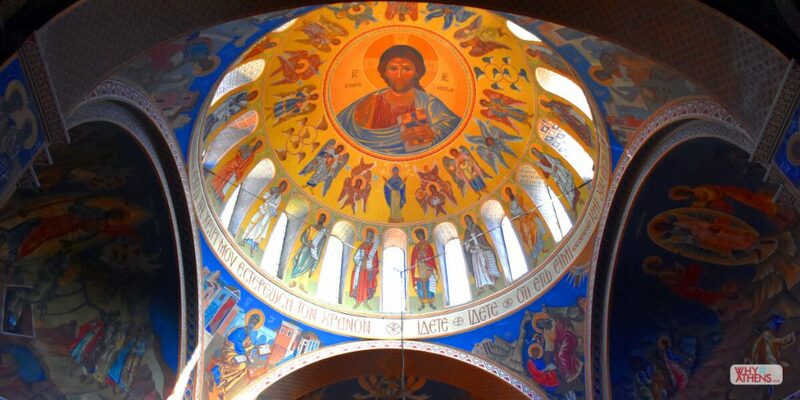 Every Easter, the world famous Greek Byzantine Choir perform hymns and is a favourite among locals. It is a special occasion to experience the Epitaph procession on Good Friday so you can choose any church or area that you may come across on your travels. 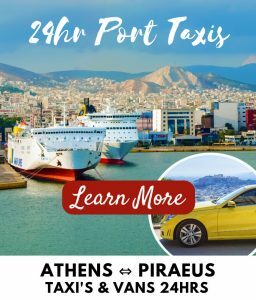 Here are some ideas of churches in Athens to choose from. On Holy Saturday, churches are steeped in hymns to mourn the death of Christ. 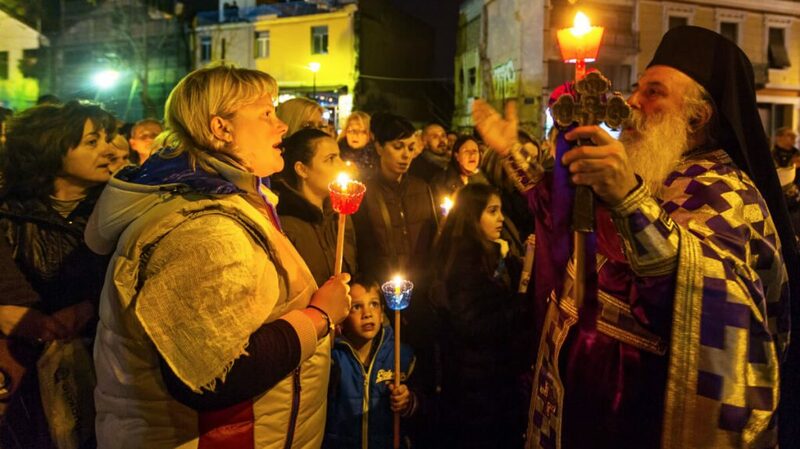 Athenians venture to their local church in the lead up to midnight, in anticipation of the resurrection. The Holy Fire is lit at the Church of the Holy Sepulchre in Jerusalem, where Jesus was crucified, buried and resurrected and is flown into Athens directly from Jerusalem on a specially chartered flight. Be at the Metohi tou Panagiou Tafou church in Plaka by 8pm to receive the light and hear the ceremony unique to its arrival. There you will witness the Greek Orthodox Patriarch use the Holy Fire to light 33 candles which go to all the Orthodox Christian Metropolis’ around the country before (which they then spread to the thousands of churches around Greece) before sharing it directly with the pilgrims in the courtyard on the church. The main event of Easter starts in the half hour before midnight, the lights of all churches and their surrounding areas go out a few minutes before 12am and the next light that is seen is that of candles (the Holy Light has now been spread around the city and country) that are passed from person to person, before a traditional hymn “Chistos Anesti” (resurrection of Christ) is sung by the congregation three times to signify the holy trinity. Why Athens Tip: get to your final church by around 11:30pm at the latest to hear the resurrection at midnight. 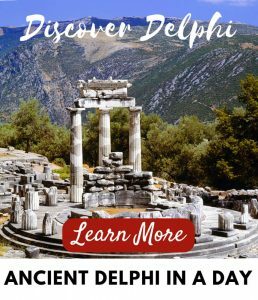 You can find some tips here on interesting churches in Athens to attend. One of the most magnificent places to experience the resurrection is the tiny chapel of Agios Georgios (St George) Church on top of Mt Lycabettus. 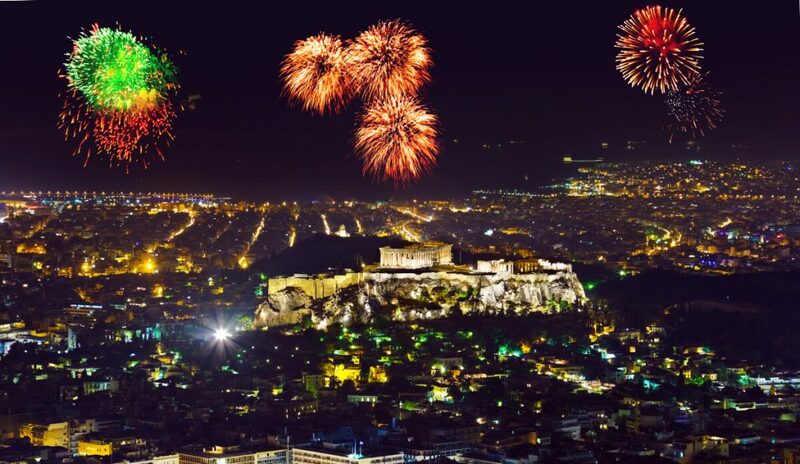 Set at 277 metres above sea level and with panoramic views across the capital, the darkness before resurrection is truly magical and is followed by a fireworks display from the peak and across Athens. 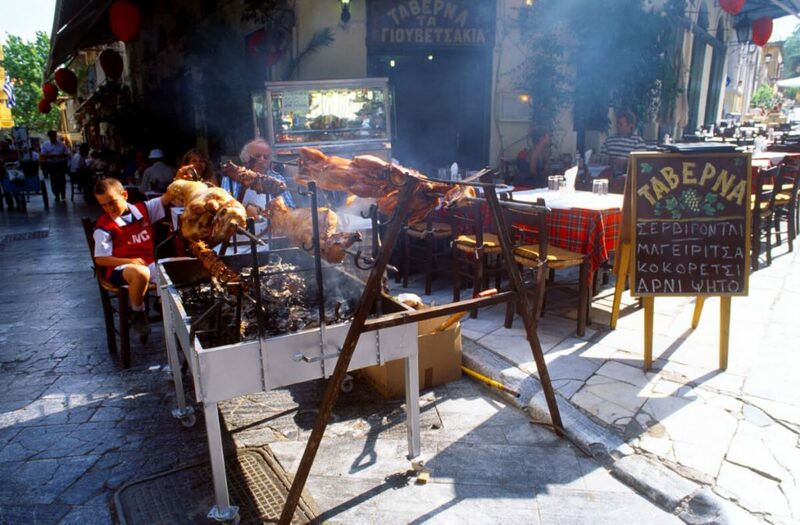 If you are not visiting family or friends in Athens during Greek Orthodox Easter, don’t despair because the feast of Easter Sunday is well celebrated throughout Athens, especially at the traditional meat tavernas which you can find in the outer suburbs of Athens and in the central old city of Plaka. 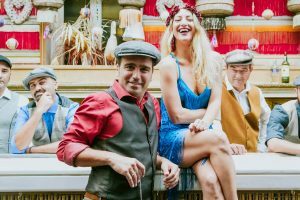 Tavernas will be alive with music and a feast of lamb and other meats are cooked on a spit around the neighbourhood. This is the day where the fasting period ends and Greek Orthodox Christians can reintroduce meat into their diet. 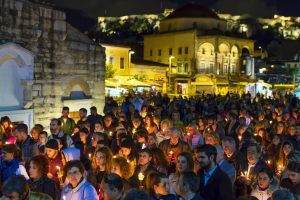 Although a public holiday in Athens, Easter Sunday is one of the most lively days on the calendar. 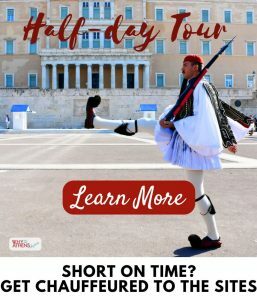 Greek Orthodox Easter in Athens is an opportunity to experience the most spiritual period in Greece ending with one of its largest celebrations. St. George Lycabettus Church. 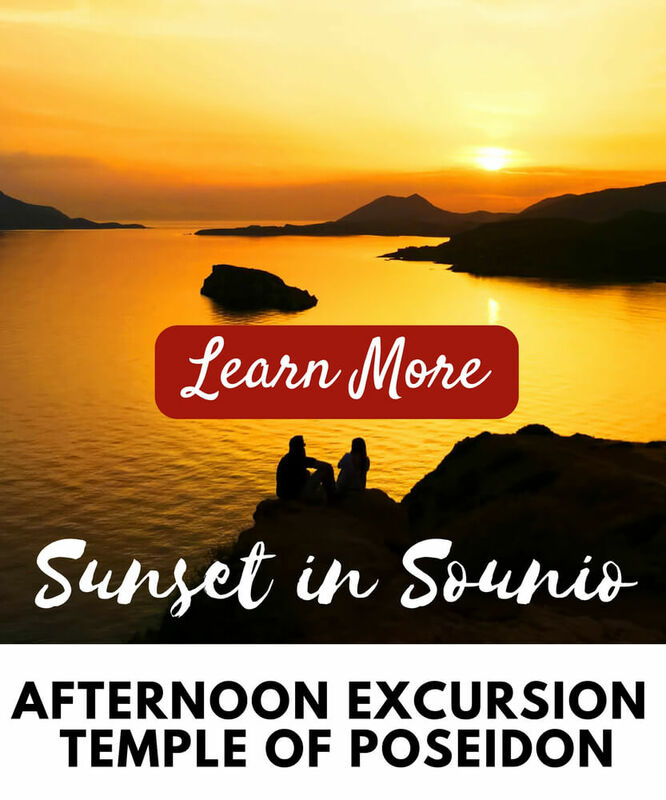 The funicular or cliff railway will get you to the top of Mt. 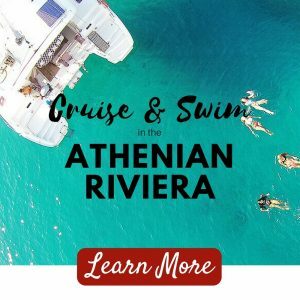 Lycabettus and runs every 30 minutes. 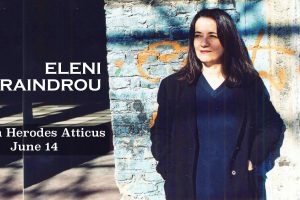 It leaves from the corner of Ploutarhiou and Aristippou Streets in Kolonaki. There is also a (steep) walking path available.